And HERE's the card by Sally Traidman that inspired me. Thanks for visiting me today - hope you're off to a GREAT Labor Day weekend! Penny Black has some really lovely background cling stamps that can carry a whole card with just the addition of a simple sentiment. Today I used the Blissful stamp. It stamps the negative, leaving the designs to be colored in as you wish. I stamped it in VersaMark ink, then heated with white embossing powder before coloring my leaves and flowers with markers. I rounded my corners and then mounted the panel to a periwinkle card. The sentiment from Eloquence with the beautiful font goes well, I think. I stamped it in black, die-cut it into a Labels 18 shape, then sponged on some ink to match before removing my die, and then popped it above my card. 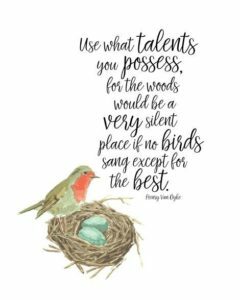 Great words to live by, don't you think? 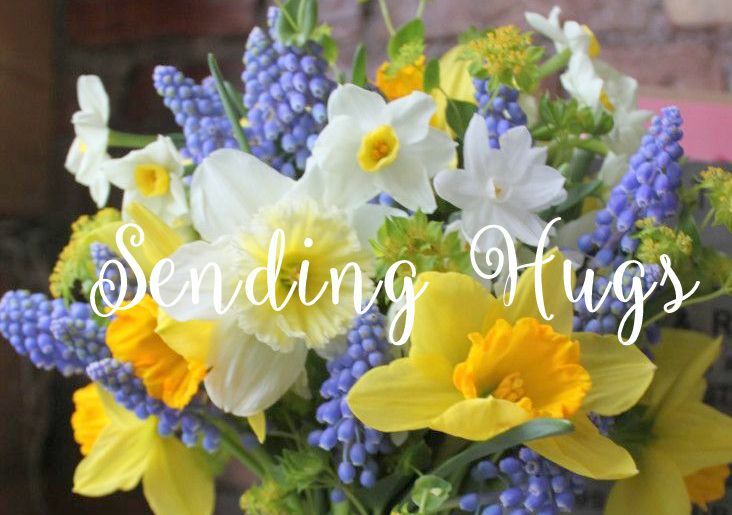 I hope you do something special for yourself today! 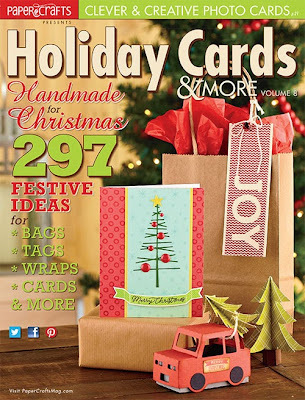 Have you seen the new catalog and stamps for Christmas at Penny Black? Hurry on over to the Penny Black store to see them all! I trimmed a piece of white cardstock to 4 X 5 1/4", then stamped some of the butterflies down the right hand side, using Hero Arts Navy, Splash, and Grass inks. Then I trimmed along the right side of my stamped panel, following a ruled guideline. After stamping my sentiment (The Craft's Meow's Fly Free), I attached my panel to a card made from Hero Arts Azure layering paper. I then attached some stamped and die-cut butterflies, along with some sequins (thanks, Heather!) for a little sparkle. 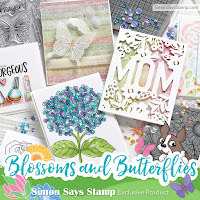 Generous Heidi has supplied us with another $50.00 gift certificate to the Simon Says Stamp Superstore! And it's almost time for STAMPtember!! EDITED TO ADD: I AM HAVING A PROBLEM WITH MY HOME COMPUTER, AND UNTIL THAT IS RESOLVED, I WILL NOT BE ONLINE AS FREQUENTLY AS I'D LIKE, SO PLEASE FORGIVE ME FOR NOT VISITING YOUR BLOGS AT THE PRESENT. Yesterday Jackie posted her latest color challenge - this one is Linen. And as soon as I saw that color, this Antique Brocade stamp popped into my mind. This is such a pretty stamp (probably hard to find by now, too), and I love how it looks simply stamped like this. So glad to play with it again! Thanks, Jackie, I enjoyed this one! Jackie Rockwell has an ongoing weekly color challenge; each week she changes her blog header to another Pantone Fashion color, and invites us to play along by designing a card using that week's color. I've been visiting our grands and celebrating my Mom's 89th birthday and doing DT work the last few weeks, so I got behind AGAIN! Here are my entries for her African Violet challenge, her Dusk Blue Challenge, and her Emerald Challenge..
For this one I started with a panel of violet paper, stamping the Delicate Flowers over it in Passion Flower ink. Then I stamped and colored in the Tall Flowers in 2 purples and a pale grey, and trimmed them out. My sentiment is from Simon's exclusive Flower Friend, and I added some grey striped washi to balance the flowers. And for the Dusk Blue challenge, I decided to try some ghost stamping. I first stamped the Garden Bouquet in Frost White ink, and after allowing that to dry overnight, again in Pool mid-tone ink, just slightly offset. My sentiment is from the new The Craft's Meow set called Potted Garden. When I saw Jackie's sample for her Emerald challenge, it reminded me of this panel I had previously made and not used; I started with shiny white cardstock and sponged on evergreen bough, peacock feathers and mowed lawn distress inks, then spritzed it with a bit of water. And in that same scrap box was this feather that I had made after finding a tutorial for it, so I put them toghether with an appropriate sentiment(TPC Studio Vintage Birdcages) for my card. Jackie will design a blog header for the winner of her challenges, which remain open until fall begins on Sept. 22; the more you play, the more chances you'll have to win! I'd love it if you'd pop over there and leave us a comment! Enjoy the rest of your weekend, and thanks for stopping!! Simple, but it kind of catches both summer and autumn! And as I've said before, this Indian Wheel background lends itself to anything! Did you know that Penny Black has introduced their Christmas stamps and catalog? Visit the store to see all the wonderful designs! 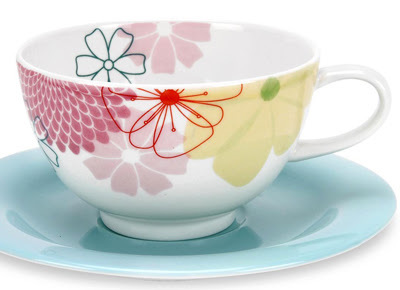 Here's the inspiration for our current Tuesday Trigger at Moxie Fab World. Since I love flowers so much and have so many flower stamps, I just had to make the time to play along. I let the picture dictate my color choices and used lots of Hero Arts flower stamps and a Simon exclusive sentiment from Flower Friend. Go and have a look at the Trigger gallery - I really love seeing how everyone interprets Cath's Triggers! I've been playing a bit more with the chalkboard papers and stamps from the Simon Says Stamp September CardKit. The reverses of many of the chalkboard papers have some pretty very pale pastel colors, and for this one, I chose this minty green. I used the stamp set, the Frost White ink, and the solid and print green papers to make this card, just adding my own pearls and bow. 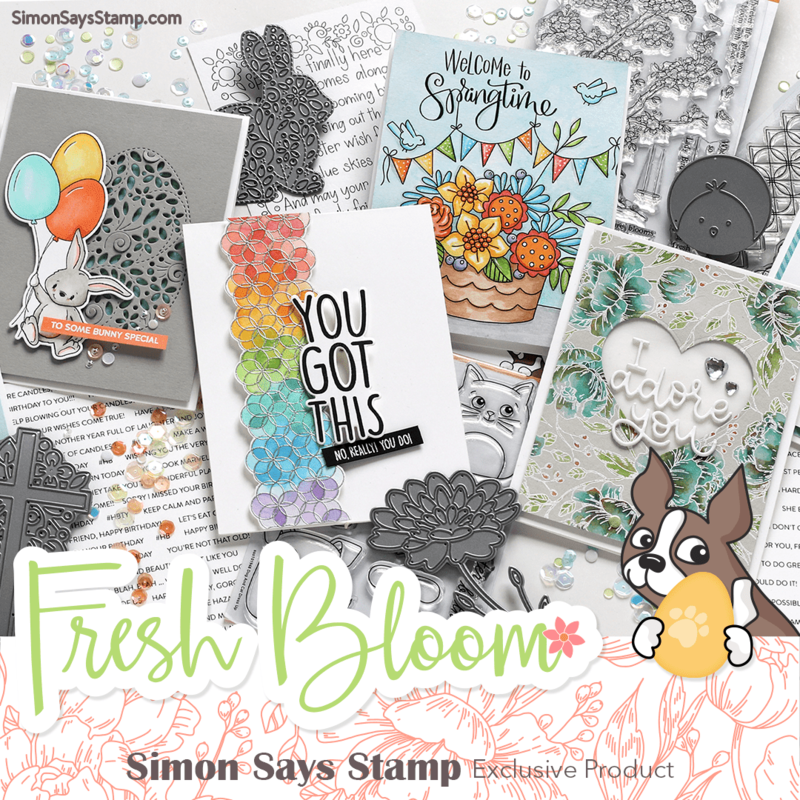 This one uses all older Hero Arts stamps: the leaves from Be Yourself, the flowers from Printed Flowers, and the sentiment from Truly Appreciated. I also used daffodil layering paper for the flowers and Butter Bar mid-tone ink for the sentiment. This card qualifies for Jackie Rockwell's Lemon Zest card challenge, too. supplies: Zig Zag Thanks, 3 Dotted Flowers, and Just Find Me, plus Green Hills mid-tone ink, and a brad from MME and some lime sequins. supplies: Carnation layering paper, white and grey cardstock, Hero Arts Leaf & Floral Background, stamped in grey and pink grapefruit inks, Untitled Word Shadow, Prima and Kaiser paper flowers. ETA: this 3rd card qualifies for the MFW Handmade Cards Week Color Media Challenge, and it falls just within Cath's 4-week posting rule. I do love using my colored inks! Thanks so much for stopping by today! Have a great one! 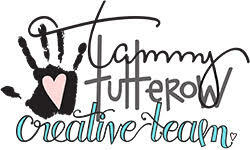 If you're here for The Craft's Meow blog hop, please scroll down 1 post or click HERE. 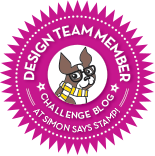 It's Wednesday and time for another Simon Says Stamp Wednesday Challenge! This week our theme is Back to School, and the DT are using Maya Road products. You mention the word school to me at this time of year and I'm in instant autumn mode, so I chose fall colors for my card. I used Maya Road's You Are stamp set for my sentiment, and a Pure Innocence set called You Make the Grade. which I paper pieced with kraft, chalkboard paper, and some autumnal design papers, coloring in her skin and hair with markers. Now it's your turn - what will you make for us this week? 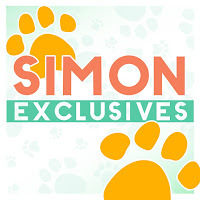 Heidi has again offered up a $50.00 gift voucher to the Simon Says Store, which will go to a random entrant to our challenge! 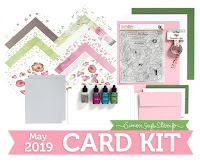 Welcome back for our traditional Design Team Blog Hop showcasing all of our new August releases at The Craft's Meow! You should have arrived here from Karen's wonderful blog. 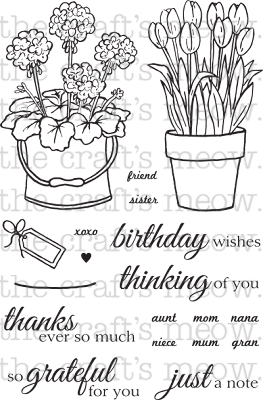 If you just happened across me, and want to start from the beginning, please go to The Craft's Meow blog, where there will be a list of the blogs participating, and from there you should be directed from one blog to the next. I made 2 cards for you today. My first uses our new sets Potted Garden, along with a sentiment from Choose Hope. For my 2nd card, I paper pieced the rose bouquet from Jar of Sunshine, glued it to a Spellbinder's label, and added my sentiment from Choose Hope. 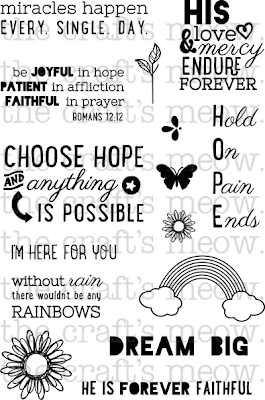 All of the sets are now available to order at The Craft's Meow Store! Don't forget that our special stamp set this month is Dream Catcher - you can have it for free when you spend $60.00 in our store, or you can buy it separately, if you wish. AND 1 lucky person will win all SIX sets by leaving a comment on each of our blogs along the hop (you don't need to comment at each blog, but doing so will increase your chances)! You'll have until 8:00 PM PDT on Friday, August 23 to leave comments, and Lisa will draw a random name from one of our blogs as her winner, and announce that name on the blog August 24! Now hop along to Nina's blog. Thanks for visiting! Hi! I'm glad to see you back for our final preview day of our newest release of stamps at The Craft's Meow! Today we have another unique set from Clare Buswell, which she calls Dream Catcher. I don't think I've ever seen any stamps like these anywhere before, and I know they'll be a hit! Besides all of the components to make several versions of a dream catcher, there are 6 sentiments, again in her wonderful mixed fonts. I kept my card very simple again today, merely creating my dream catcher and adding a sentiment, embossing them all in white and adding some pearls. This set is available for free this month with a purchase of $60.00 or more, or you can buy it for $15.00 at any time. Would you like to win it? Just leave a comment at The Craft's Meow Blog by 8:00 PM PDT tonight and a lucky random commenter will take it home! The winner will be announced tomorrow, during our traditional blog hop, where we showcase more cards using all of the August releases! Hope to see you then! Welcome back to our third day of previews of our August stamp releases at The Craft's Meow! Today we're showcasing Nina Brackett's latest designs, and she has outdone herself once again! She calls the first one Folk Art Blooms. This set includes all solid images of 3 different flowers in 2 sizes each, plus various leaves to compliment them. I loved working with this set! I really have grown to love masking, so I made a card using the masked sentiment technique and used only one of the flower designs in both sizes, some leaves, and one of the centers from another of the flowers. The sentiment is from a set we debuted earlier this release, Potted Garden. This card is one layer, with just the addition of some aqua and yellow pearls. Nina's 2nd set today is called Jar of Sunshine, and it consists of a canning jar, along with a straw, an lemon/orange slice, a gorgeous spray of roses, and 5 different sentiments in this chalkboard style. 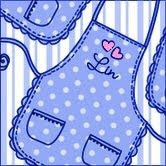 I went off the path a bit with my card, remembering my favorite old-fashioned blue canning jars that I treasure. I used Nina's flower wrap motif from the set, along with some design papers from My Mind's Eye (Indie Chic) and Pebbles (Family Ties), and some cork paper for my scalloped edge. Don't forget to visit The Craft's Meow Blog and leave a comment there by 8:00 PM PDT this evening for a chance to win both of these sets by Nina!! The random winner will be announced there tomorrow when we unveil our final stamp set for this month. Good morning! Welcome to our second day of previews of our newest releases at The Craft's Meow! Today we're introducing another of our newest illustrators, Angelica Suarez. Her set today is called Choose Hope. It's filled with lots of uplifting sentiments, along with some small images to go with them. For today's card, I let one of the sentiments be the star, just adding some die-cut leaves and popping my panel above the card base. Would you like to win this set? Just hop on over to The Craft's Meow Blog and leave a comment there by 8:00 PM PDT. The winner will be announced tomorrow when we show you some more of our new stamps for this month! Please come back and visit me, too, tomorrow; we'll have TWO sets to show you then! Welcome to our first day of previews of our newest stamps being released this month at The Craft's Meow! 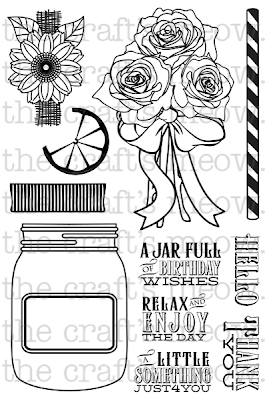 Today we're introducing 2 stamp sets by our newest designer, Clare Buswell, and I know that you will love her designs! Being the flower lover that I am, I couldn't wait to get these ones inky! Clare's next set is called Cottage Garden, and it's one of our big sets, including almost any garden flower you can think of, 7 different sentiments, again in a mixed font, and she even thought of other details like butterflies, a garden bench, and stones to mix in with the flowers! I chose these hollyhocks for my card this time, and stamped a panel full of them, again coloring them with markers. 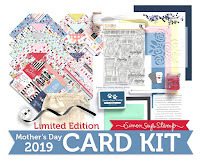 Please visit The Craft's Meow Blog today to see all the other fantastic samples that my team-mates made using these 2 sets, and while you're there, don't forget to leave a comment by 8:00 PM PDT for a chance to win these 2 amazing sets!